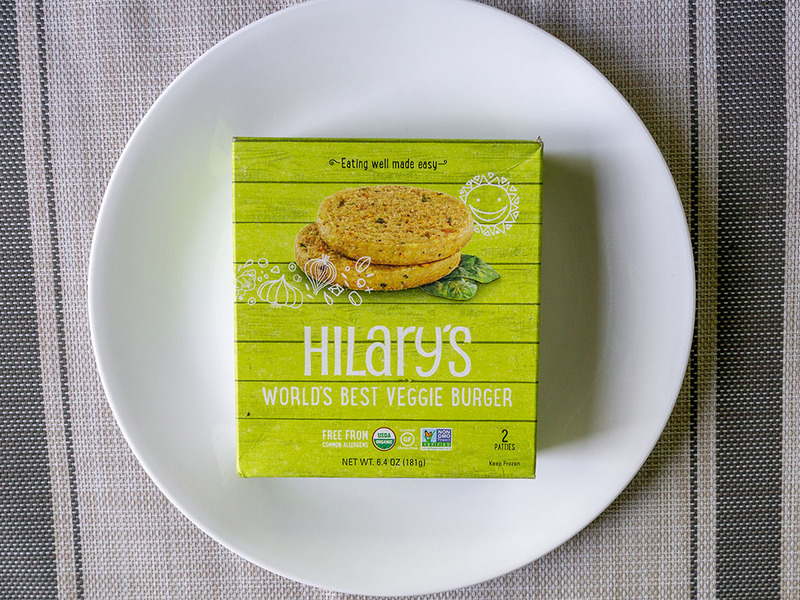 Are Hillary's Worlds Best Veggie Burger any good? For me, sadly no. 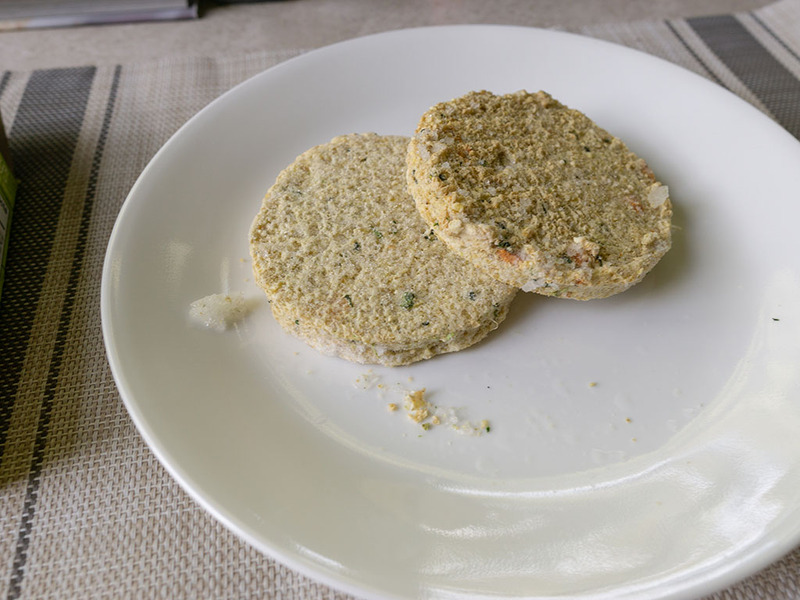 While the burgers might be a good fit for someone with a very restricted diet being free of many allergens – their taste and texture were very unappealing to me personally. The World’s Best – it’s a bold claim in any field. So much so, you’d imagine the assertion would only be made by someone with supreme confidence or endless plaudits. 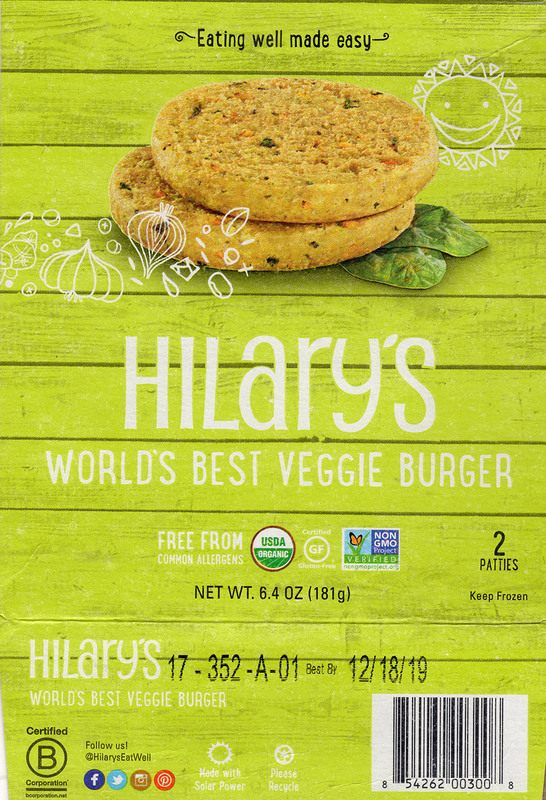 Enter stage left then – Hillary’s Worlds Best Veggie Burger. With the current surge in meat free eating, and that heady name – how could I not take them up on their own word? Into the shopping cart it went. I was hopefully going to have a World Best experience ahead of me. Out of the box (see below) the patties are a fairly uninspiring pale yellow color. I decided to cook these burgers in the pan with a little oil, since microwaving is not recommended here. As soon as the oil came to temperature I noticed a really off-putting aroma; this seemed to dissipate toward the end of cooking, but still, it was enough to cause me some concern. Strike one. Strike two came trying to get these patties safely to a bun. As the burgers developed a nice exterior crisp, they promptly started to disintegrate in the pan. This ultimately meant loading up the bun with small fragments of the patty and squishing it all together. Suffices to say, it made for fairly messy eating. Lastly, strike three came in the tasting. These are very bland burgers, in my test burger below, completely overwhelmed by simple garden veggies. The hot-from-the-pan crust was a fun texture at first, but as they cooled, these just became mushy filler getting in the way of my bright and fresh veggies. I ended up discarding the last third of the patty and just ate the burger with the veggie toppings instead, much more pleasant. 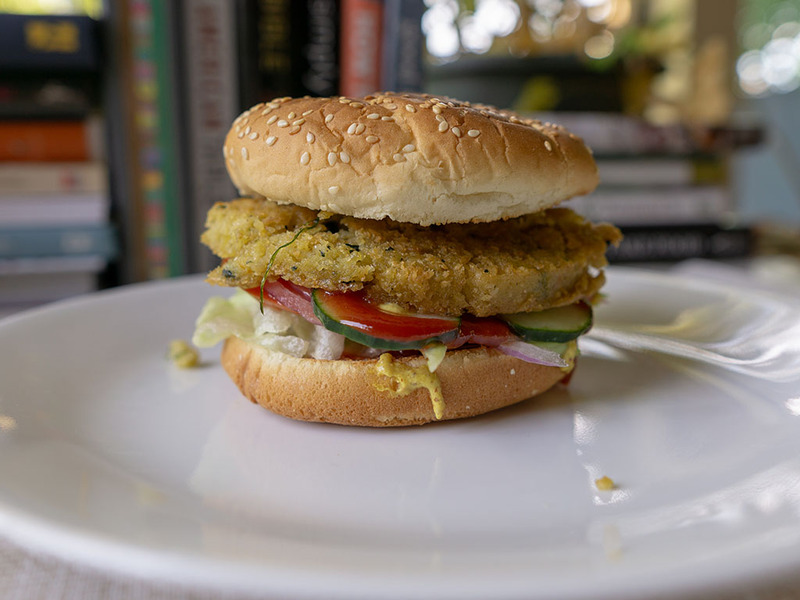 Sadly, I can’t agree with the proclamation that this is the worlds best veggie burger; far from it, if anything it’s one of the poorer meat free burgers I’ve sampled. There is one bright light with this burger – the lack of many common allergens – see below for more details. I paid $3.39 for this package from Natural Grocers. Two patties come sealed in one plastic envelope inside the cardboard box – each is 3.2 ounces in weight. The burgers list pan cooking, oven and grilling as cooking options with the microwave not recommended. Based on my own experience cooking in the pan I wouldn’t recommend the grill either – their relatively flimsy texture means they’re liable to break down over a high heat grill. With just 4g of protein this is a fairly unremarkable patty against its contemporary competition. Factor in that each patty comes with 5g of saturated fat and 27g of carbs, it’s even less appealing. 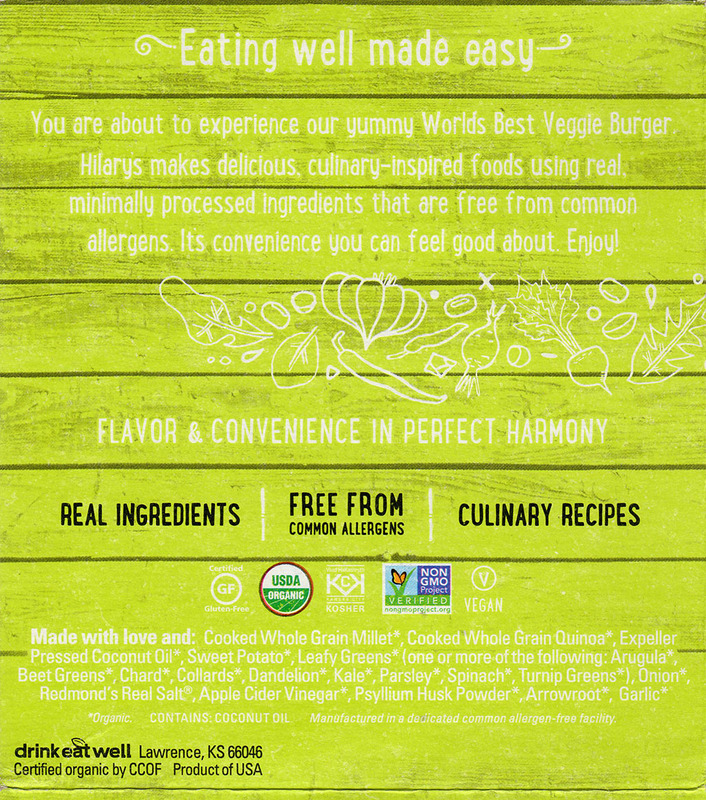 A huge plus point for this burger is that is listed free from many common allergens. 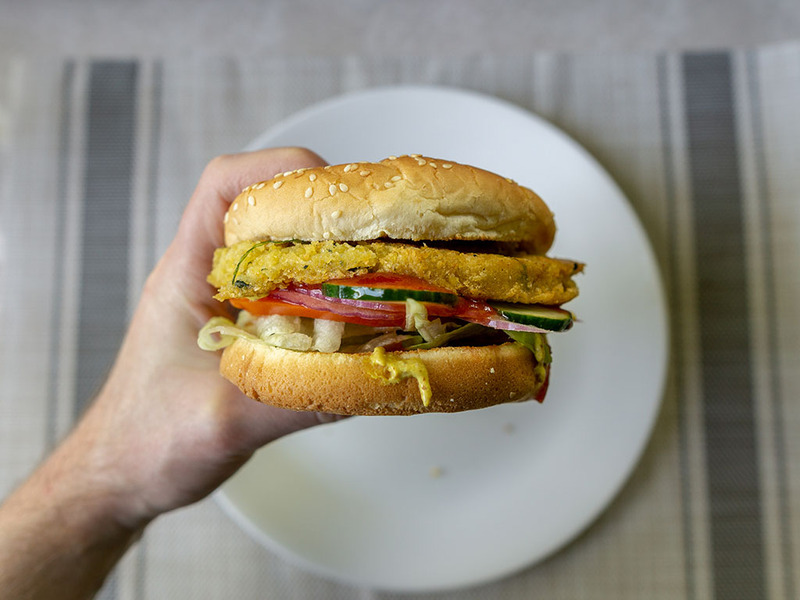 The burger is listed free from gluten, GMO, corn, dairy, soy and nuts. This could make the burger perfect for those with very restricted diets.